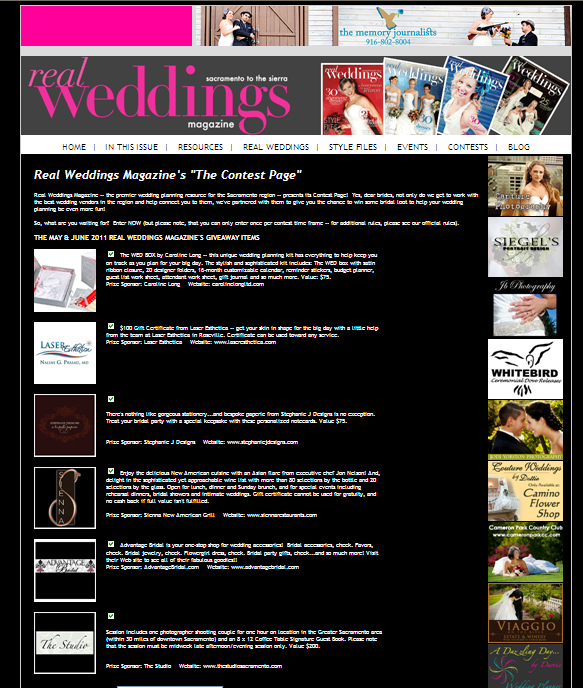 New Giveaways on Real Weddings Magazine’s Contest Page! That’s right dear Real Weddings brides — we’ve got new goodies to give away! 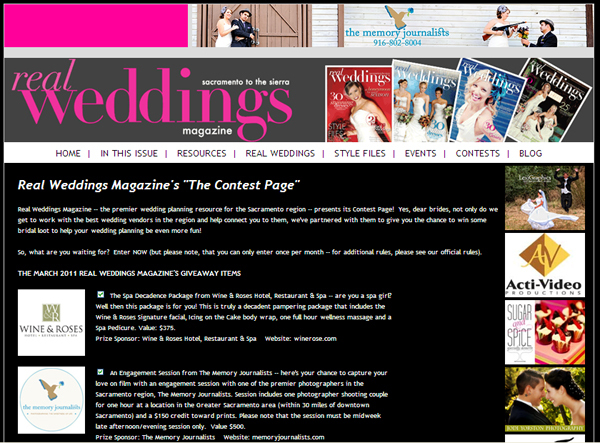 CHECK OUT THE REAL WEDDINGS MAGAZINE CONTEST PAGE! Not only do we get to work with the best wedding vendors in the Sacramento region and help you connect with them, but we’ve partnered with these fantastic vendors to give you the chance to win some bridal loot to help your wedding planning be even more fun! Advantage Bridal is your one-stop shop for wedding accessories! Bridal accessories, check. Favors, check. Bridal jewelry, check. Flowergirl dress, check. Bridal party gifts, check…and so much more! Visit their Web site to see all of their fabulous goodies!! Tank top value: $40. Session includes one photographer shooting couple for two and 1/2 hours on location in the Greater Sacramento area (within 30 miles of downtown Sacramento). Please note that the session must be midweek late afternoon/evening session only. Value $450. Experience the Native American Exfoliation facial utilizing The Tiger’s Eye Skincare exclusive all natural Native American Clay. Your skin will positively glow! Value $90. Enjoy the culinary delights of Sequoia! Sequoia is more than just a restaurant. It’s a destination, a refuge from the ordinary, where anything is possible and every event makes cherished memories. Enjoy the majesty of The Delta King with this River Romance Package. This exquisite package includes a stateroom for two, $60 credit to Pilothouse Restaurant, 2 tickets and breakfast in the Pilothouse Restaurant the following morning. Some restrictions apply. Taxes included, gratuities not inlcuded. Value: $250. Yeah, we really will be giving away all of this great stuff!! So, what are you waiting for? Enter NOW (but please note, that you can only enter once per contest timeframe — for additional rules, please see our official rules). Please note that you should be a valid greater Sacramento bride-to-be to enter our contests! 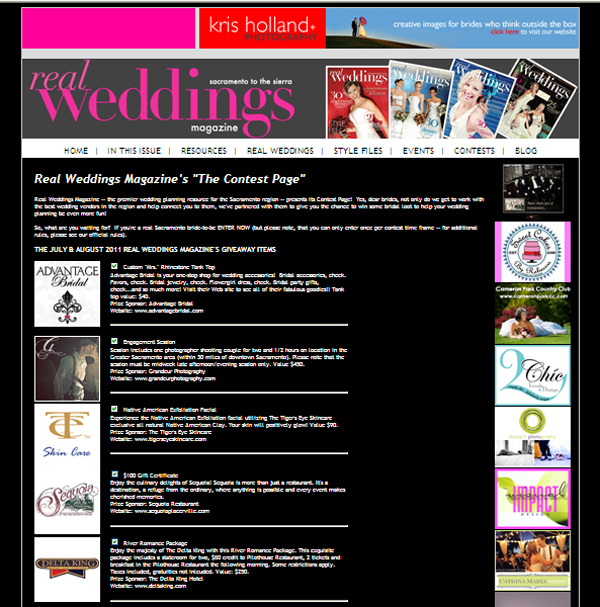 Again, we’ll have new contests every other month, so Real Weddings brides be sure to check back in September to register for our Real Weddings Magazine’s September & October contests!